The Xerox VersaLink C7025 Color Multifunction Printer is very easy to integrate into your business. A great thing about this printer is that it provides you with increased productivity on your day to day tasks. This copier is designed to cause fewer maintenance problems because it was built with fewer moving parts and a strengthened paper path. This helps you have fewer paper jams, making your work more efficient. copier to fit in with your business’s needs. 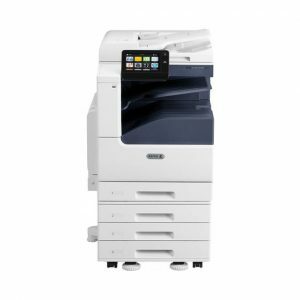 This copier keeps up with current technology because it offers instant connectivity to cloud and mobile devices. The Xerox VersaLink C725 also has cloud-hosted services that allow you to work anywhere you want to. Provides a print resolution of up to 1200 x 2400 dpi with a printing speed of up to 25 pages per minute this copier offers fast speed and amazing quality prints. It’s time to get rid of your outdated color copier and get a copier that is the newest technology in printing. This MFP copier comes with IT free installation wizards and step-by-step configuration making it very easy to install and use this copier.